I wrote last week about the Home Depot workshop so after that I thought that it be good for me to attend one. I called my local store which was 2 miles away and I confirmed that the workshop was for this Saturday (Willow Grove PA). Now that I knew for sure I registered for the workshop online which was a fairly simple process. Saturday morning came and it was a really nice weather day with blue skies and large cotton ball like clouds and even better, a temperature of about 80 degrees. The good thing is that the humidity was not high enough to make it feel warmer than it really was. 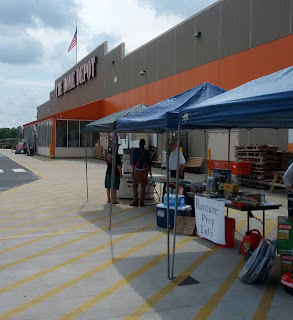 This was an ideal day to be outside and as I arrived at Home Depot I found that the workshop was held right out front of the store under two tents. The workshop hosts were friendly and happy to share their thoughts and suggestions as they had several tables with their products on display. 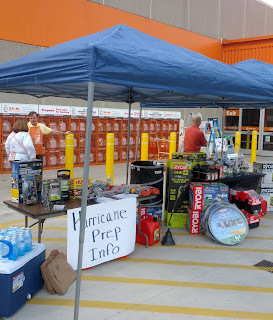 LED Flashlights, Batteries, a portable battery powered NOAA Weather Radio, Pole Saw, Chain Saw, work gloves, gas can, generators (multiple sizes), generator power transfer kit, extension cords, trash bags (the kind for lawn debris), coolers, and bottled water. The supplies and tools were good for preparation and for storm clean up. I would have liked to see more items such as road flares, first aid kits, a camping stove and water tight containers for food, electronic gadgets, cash and medication. To customers who were curious or who were passing by, they received two handouts which where checklists. One handout was a “prepare for a hurricane check list” for supplies and links to different websites for news updates, and for more preparedness information. The other guide or checklist was a portable generator trouble shooting checklist that had tips and contacts to seek a repair shop through various generator manufacturers. There were four people behind the tables making a good effort to reach out the customers walking by the front of the store. I was there on time and unfortunately (and I could be wrong) I do not think many people actually registered for the event. I did not see a public ad other than in their website for this event which I think could have attracted more potential customers. There were a few customers that had really good questions about generators and their installation. I listened to their questions intently and the discussion that went on. This is where my ears really perked up because I know very little about generators. Here are a few things I learned about Generators. They have a generator large enough to run your entire homes electrical needs. They have generators that automatically switch on (in about 20 seconds) when the power goes out and this type of generator can run from your natural gas line in your home. It is recommended to purchase a power transfer kit that allows the connection from the electric company to be disconnected from your homes wiring. This Power Transfer devices allows you to switch your electric supply powered directly by your generator. The power transfer kit will help eliminate two issues. One is that you won’t have to run a bunch of extension cords through your house via windows and doors and second you can avoid an electrical overload if you try to connect the generator yourself to your wiring of your home. Along with the information that was provided I met Lieutenant Robinson from the Upper Moreland Police Department. He was one of the four helpful individuals who were behind the tables not sitting down, but on their feet the entire time assisting customers with questions. He heard me introduce myself and talk about storms that have affected this area. Since I have been doing research on severe weather only recently, he corrected me when I stated that this area normally does not see many severe storms. You see I am sort of a messenger, I bridge the gap of the average person’s perception of bad weather and the information I collect as I learn from experts. I watch the news media like everyone else where we see stories of large Hurricanes and Tornadoes and the destruction that they cause out west or down south (as in not here). The problem is we do have strong storms but we are less likely to pay attention to warnings or to learn how to be prepared. I have taken a few classes but in terms of experience I had not taken much notice of storms until I met T.S Irene. Lieutenant Robinson said that this area does see its share of severe weather and proceeded to state a few examples such as Irene, Floyd, Allison and that a tornado that went through the area that caused significant damage to a roof of a building and to trees. He described the damage like someone took a large knife and sliced the top of the trees off and the roof was lifted completely off the building and carried it away. The whole point here is that Lt. Robinson has many years of experience helping people and that included in strong storms with flooding and wind damage. Just because we are not out by the shore or in Tornado Alley does not mean we do not see bad weather. Maybe our news sources could help by educating the public with weather history. I learned quite a bit from asking questions, and here is an example. Did you know that your spare tire can be used a flotation device? Yes, it helps to have 32 lbs. per square inch in a rubber spare waiting in your trunk in case you are surrounded by a lot of water. The more pressure, the more air and air is a lot lighter then water which means you will float and will do it very well. Would I recommend the workshop to others? Yes I absolutely do, they have people that know their products and what is needed for installation and they also have public safety experts there to help explain the reality of severe weather. – Thank you Home Depot. Remember to check your local news for weather alerts daily and that a weather alert radio can keep you and your family safe. Customer Service is something we usually think of when we call on a phone to ask questions for help. Home Depot is really stepping up and helping it's local communities by offering a free Hurricane preparedness workshops right in it's stores. I found out about these workshops from FEMA through a campain where citizens and organizations have come together and are actively helping people learn about being prepared for severe weather. The campaign through FEMA is called the "National Preparedness Community". I am a registered member and I use my blog and online resources to spread the word about the dangers of severe weather and what to do to be prepared. I searched and found that there are (of course) many workshops available throughout the state of New Jersey. This makes sense considering how Hurricane Sandy affected the east coast. Home Depot has stated that you should call your local store to make sure that they are offering the workshop.